Great Spangled Fritillary at Frederick State Forest. The Great Spangled Fritillary (Speyeria cybele) is an extremely visually striking butterfly that can be found in forests, woods, meadows, open areas … really, a lot of places. 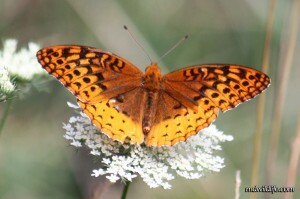 The Great Spangled Fritillary is very common in Maryland. It’s a fairly large butterfly, tends to rest with open wings and gives a fantastic display of bright orange with strong black patterns. Its wing color fades from a lighter to stronger orange, while black lines weave a web-like design and dots are placed along the hindwings. A full, opened wing view of the Great Spangled Fritillary. The butterfly’s underside is a dark orange as well, but is highlighted by various white markings. It is a warm weather customer as I have experienced sightings of this Fritillary in the late spring, but find it to be much more common in the summer months. 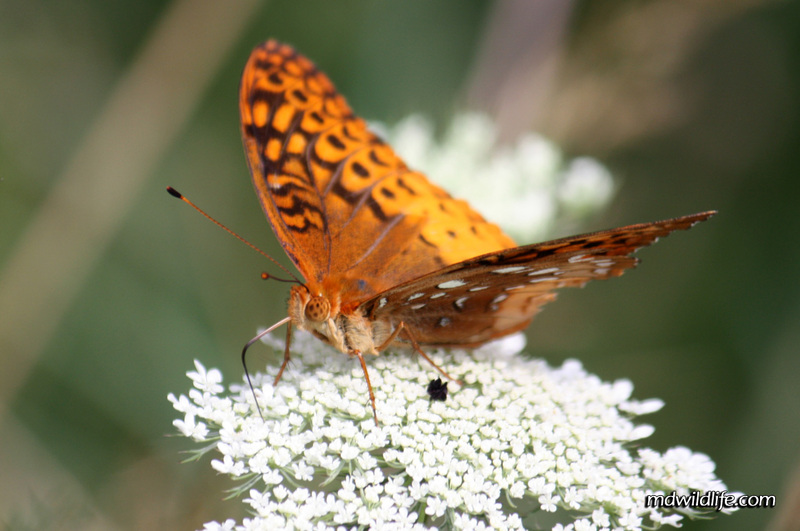 There are several other Fritillary and lesser Fritillary species that inhabit areas in Maryland, but the Greater Spangled seems to be so easy to pick out. The Variegated Fritillary appears most similar, but is somehow, oddly, obviously different. It’s hard to explain. Look at my Variegated Fritillary writeup. When you find the Great Spangled Fritillary at a bush or flower in an open meadow, it can be very accomodating to a photo session. I must have had a good 15 or 20 minutes with one at Middle Neck Run in Newark, Delaware. On a completely ‘unrelated-to-Maryland’ note, I once photographed a Great Spangled Fritillary on top of a mountain in Vermont, so it’s a species that has some flexibility in where it can travel.